Does the mention of Valentine’s Day make you think of big, heart-shaped boxes of chocolate? Many people associate this holiday with chocolate indulgence. But there is a healthier way to celebrate this heart-centered holiday – and remember – chocolate can be healthy but instead of choosing milk chocolate, choose dark chocolate. I always choose Fair-Traded, organic 70% dark chocolate when the choice is mine. 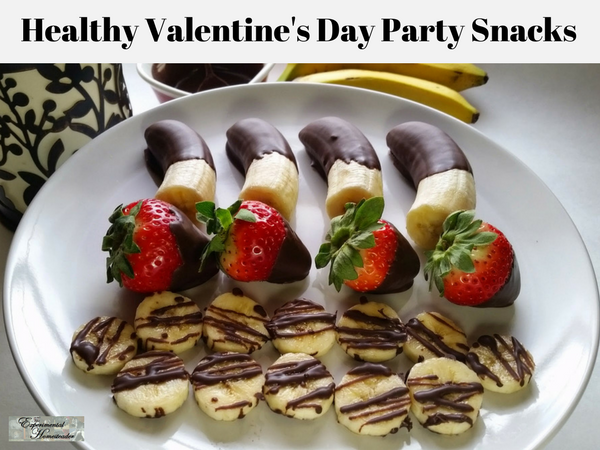 Valentine’s Day is a great time to introduce your loved ones to healthy party snacks that they just might ask for year-round – and let’s face it, there is no better way to say I Love You than to encourage healthy eating. Insert a wooden skewer into the bottom of a fresh strawberry, banana or other fruit that you like. Dip the fruit into melted dark chocolate that is at least 60% cocoa. You can decorate these with popping sugar, those pretty colored sprinkles or to make them even healthier, crushed nuts. When the chocolate is cool, arrange the strawberries in a vase or other container or simply lay them out on a decorative plate. They are still loved by kids. Although many people do not consider Jell-O healthy – and some even talk about how bad it is for you, there is another option, you can make your own. Simply mix together hot water, Knox gelatin – or a similar brand and fruit juice such as red grape, cherry or cranberry to keep with the Valentine Day theme. Pour the mixture into heart-shaped molds or let it solidify in a pan and cut into heart shapes using cookie cutters. You can add some red food coloring to plain cream cheese or buy strawberry-flavored cream cheese. Use it to make healthy Valentine-themed snacks, such as heart-shaped bagels. Or use it as a dip or spread for strawberries or other fresh fruit. Another option is to do a search for a fruit pizza recipe and create the crust so it is heart shaped. Use the pink cream cheese and cherries or strawberries for the toppping. Watermelon is great for cutting into shapes. Cut heart shapes for a healthy treat but be sure to choose a red watermelon instead of a yellow or orange. Nature provides a lot of red fruits that look pretty on a skewer. Cherries, raspberries, strawberries, and even cut-up red apples can all be put on a skewer and enjoyed by young and old alike. Serve with pink cream cheese or a fruit dip. Another option is to drizzle dark chocolate on the fruit once it is on the skewer to make it look pretty. Valentine’s Day is a heart-themed holiday. Think of heart-healthy foods and serve those as snacks. For example, heart-healthy seeds and nuts like sunflower seeds and almonds can be served in pretty muffin papers or heart-shaped containers. Make heart-shaped bran muffins, or arrange sliced strawberries in a heart on top of a bowl of oatmeal. Use your imagination and think of all the foods that are red that are good for you. Using a cookie cutter, cut whole wheat bread into heart shapes. Make sandwiches with whatever healthy filling you like – the heart shape makes it festive. For an extra touch, put a decorative red toothpick or bamboo skewer through each sandwich. Cut whole wheat tortillas into heart shapes. Brush them with olive oil, sprinkle them with salt, and then bake them at 425 degrees F until crisp – about 8 minutes. Serve these with red, tomato-y salsa or other seasonal dip. Focusing on the heart means healthy foods. Chocolate, whole grains, and other foods mentioned in this article are not only festive; they are good for the heart. Keep in mind Valentine’s Day is not the only day that it is a good ideal to eat heart healthy foods – and decorating your food or making it into unique shapes is always fun!